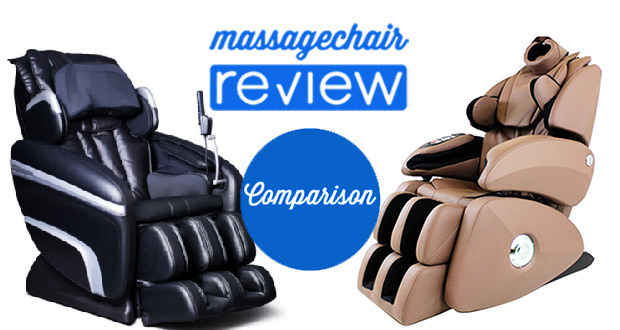 Today, we will be comparing the Osaki OS-7200H vs Osaki OS-7075r massage chairs. 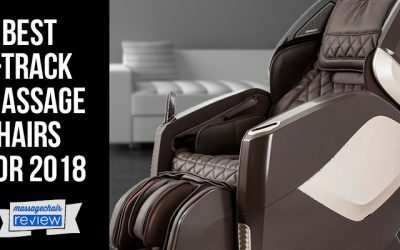 The Osaki and the OS-7200H are identical and the only difference between the two massage chairs is that the OS-7200H has heat. 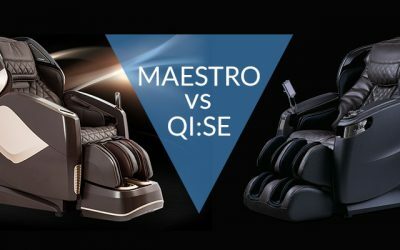 This is why I will be referring to the Osaki and OS-7200 as the same massage chair through out this article and comparing them both to the Osaki OS-7075r. So let’s go compare! First, let’s take a look at the similarities between the Osaki OS-7200H vs Osaki OS-7075r. These are very different massage chairs, however they do share some similarities. They both have advanced body scan technology, quad rollers, 31” roller stroke, a large selection of automatic and manual massage modes, chromotherapy, and zero gravity recline. All Osaki massage chairs have advanced body scanning.This is a feature that uses optical scanners that roll up and down your spine, measuring the width of your body and scale of the massage areas to match your exact size and shape. All of Osaki’s models have a quad roller system with twin rollers. These are massage heads that open and clOSe mimicking the feel of human thumbs and fingers, enhancing the overall massage experience. The Osaki OS-7200H vs OS-7075r both have a 31” roller stroke. This is one of the longest roller strokes on the market, and this allows for the massage heads to massage from the neck all the way down to the tailbone. This also allows it to accommodate a user between the heights of 5’2” to 6’5”. Both of these massage chairs all have a nice selection of auto and manual programs. They both utilize all the main massage techniques, and are very similar overall. 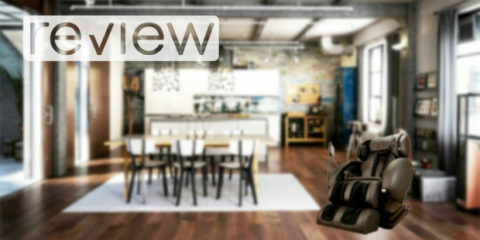 There is really not a better choice between the two, and most users will be happy with the selections on either chair. This is the strip of blue light that you see on the sides of the Osaki OS-7200H and OS-7075r. This is a newer feature that I have only seen on a couple of massage chairs. So, what is Chromotherapy? This is a type of therapy that uses light in the form of color to balance the energy wherever a person may be lacking. This could be physical, emotional, spiritual or mental levels. This is absolutely one of the best features of these two massage chairs, and on any massage chair honestly. The zero gravity position is a position created by NASA and used by astronauts. This is position where you’re reclined at about 170 degrees and the seat is raised 30 degrees – your legs should be elevated above you heart. This puts you in a state of complete weightlessness and relaxation – perfect for a full body massage. 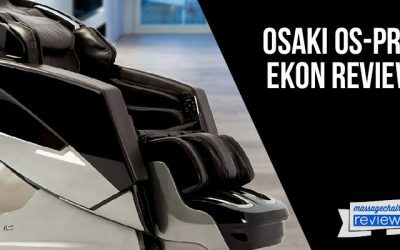 We have discussed some of the similarities between the Osaki OS-7200H vs OS-7075r massage chairs, now let’s take a look at what makes them so different. 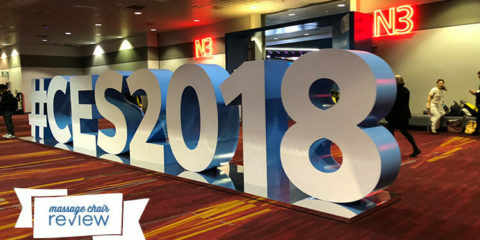 Here are some of the main differences that I will be discussing below: strength of massage, design, air massage system, heat, and music system. 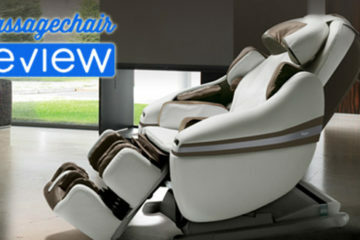 The main difference between the chairs is that the Osaki OS-7075r is focused on deep tissue massage chair. It has three strength setting ranging from strong, stronger, and strongest. This is a great massage chair for the individual who is looking for a deep massage, such as an athlete looking to reduce fatigue and recovery time. The Osaki OS-7200H on the other hand has five strength setting, which allow you to get a mild massage as well as a nice deep massage too. 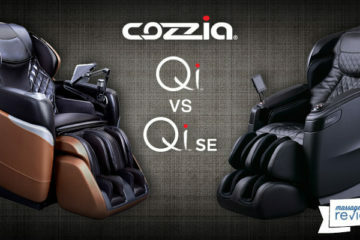 Another difference is the overall look and design of massage chair. 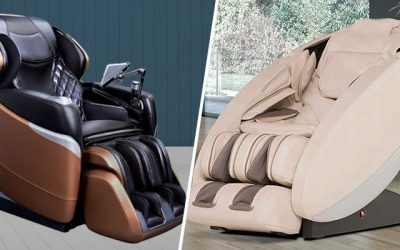 The Osaki OS-7200H is very similar to the look of the very popular Inada Sogno Dreamwave massage chair. It is modern and sleek with straight lines rather than curved lines like the OS-4000. The Osaki OS-7075r on the other hand is slightly larger and has a unique futuristic design. Both massage chairs are very popular and have become some of the bestseller on the market. 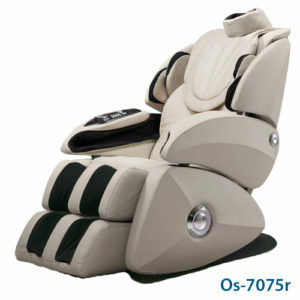 The Osaki OS-7200 and OS-7075r both have extensive air massage systems. 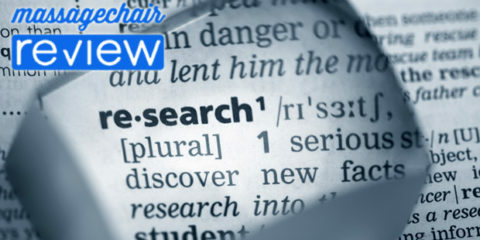 Air massage has become very popular in massage chairs and helps promote circulation and helps reduce fatigue. The OS-7200H has 51 airbags and the OS-7075r has 47 airbags. Both massage chairs have airbags that massage the arms, hands, legs, calves, feet, shoulders, and thighs. The main differences is the Osaki OS-7200H have a head piece that has airbags that massage the trapezius muscles at the top of your shoulders. The Osaki OS-7075r does not have a head piece, but more of a headband with airbags that you actually place on your head. The airbags inflate massage your skull and there are a couple nodules that press against the muscles in you skull. 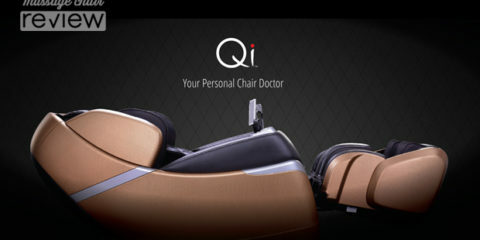 This is an innovative feature an the OS-7075r is one of the first massage chairs with this technology. The Osaki OS-7200H has heat in the shoulder lumbar area, and the Osaki OS-7075r has a full body heating system that heats the waist, knees and ankle joints. The heat is used to loosen muscle tissue so that the rollers can apply a more effective and deeper massage. The Osaki OS-7200H have a music system and the OS-7075r does not. The OS-7200H comes with an attachment that you can plug you most music devices into. The music is then played through two high quality speakers build into the shoulder massagers. The music can also be synced with the vibration massage. This is definitely a nice feature, and it’s very easy to use. The Osaki OS-7200H price is $3795 and the Osaki OS-7075r price is $4,295. These are all really good price points for these massage chairs and all them have been top sellers this year. The Osaki OS-7200h has a very comprehensive airbag foot and calf massage. The Osaki OS-7075r on the other hand has foot rollers underneath the soles of the feet that help knead out soreness and provide better therapy to swollen and injured feet. 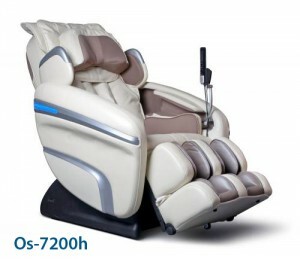 The air massage in the OS-7075r and OS-7200h are very similar. Osaki OS-7200H vs Osaki OS-7075r | Which to Buy? This really comes down to personal preference. 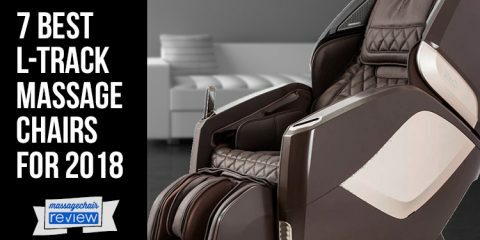 If you’re looking for a massage chair that is focused on deep tissue massage, then the Osaki OS-7075r is the massage chair for you. It is great for the active individual who is looking to reduce fatigue and recovery time. The Osaki OS-7200H on the other hand, has a larger range of strength setting – five to be exact. This is perfect for someone who is looking for a massage chair for a variety of users. It does have a nice deep massage, but it also can be adjusted to a much lighter massage. I honestly would be happy with either massage chair. they both deliver great massages, and are back by a company with great warranty support. 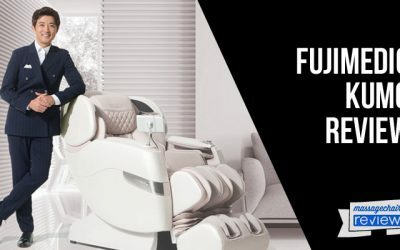 If you would like to buy or learn more about the Osaki OS-7200H and Osaki OS-7075r, please check out our preferred partner – Emassagechair.com.